DJI drones are some of the best known available right now, they're also some of the best full stop. The Phantom series are now in their third generation and have split off into three levels. But which is right for you? The DJI Phantom 3 Standard is the latest addition to the family, offering a more affordable entry-level drone for hobbyists. Then there's a step up to the Advanced and Professional models. For most, non-professional users, the Standard drone may offer enough. But others may need slightly more options. 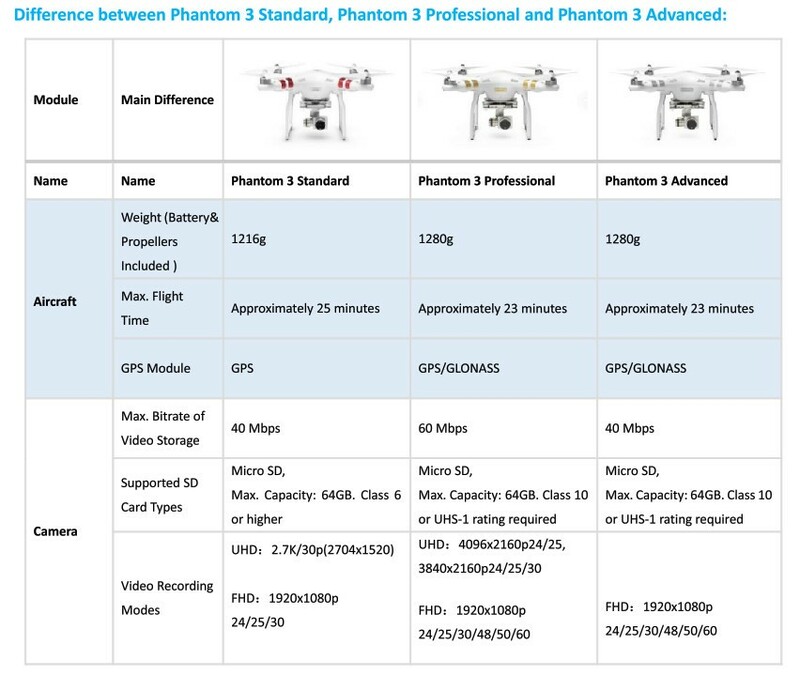 We've compared the three Phantom drones so you can find the best one for you. So, which DJI Phantom drone is your next air bound companion? One of the biggest differences across the range of Phantom drones is the cameras. This is an area where the price can change drastically but one where many people won't really need to splash out for the top end. The DJI Phantom 3 Standard features a 12-megapixel sensor for up to 2.7K resolution video at up to 30 frames per second, carried at 40Mbps. Jump up to the Phantom 3 Advanced and you get a Sony Exmor 12.4-megapixel sensor and video of up to 2.7K and 30fps also with 40Mbps bitrate. Then when you hit the top end with the Phantom 3 Professional you also get that Sony sensor but with the ability to record up to 4K resolution also at 30fps but with a bitrate of 60Mbps. Another area where there's variation across the models is flight range. The Standard model can manage up to 1,000m in distance using the supplied controller. But this is the FCC rated number, when outdoors and unobstructed. The Advanced and Professional models both have the same range as each other which is also based on outdoor, unobstructed use. These can go up to 2,000m away from the flier using the supplied remote controller. Battery charging is a big part of drone use. Since drones only fly in the air for a limited time it's ideal to have a charger that can get you back up right away, ideally with two batteries on cycle. The Phantom 3 Standard and Advanced both feature 15.2v, 4,480mAh batteries that charge at 57W. The Professional has the same sized battery but charges at up to 100W. But it's the Standard that wins out here, for flight time, presumably partly thanks to it's different camera sensor. It can manage a 25-minute flight time where the Advanced and Professional top out at 23 minutes. Not a huge difference, true, but a win for the Standard at least. The flying abilities for the three Phantoms doesn't vary massively, but there are difference. All three Phantom 3 drones fly at 16 metres per second, ascend at 5 m/s and descend at 3 m/s with a max above sea level altitude of 6,000m. The Phantom Standard uses GPS while the Advanced and Professional models also feature GLONASS. The Standard weighs in at 1216g while the other two top the scales at 1280g. Controlling all of the Phantom 3 drones is easy enough with the accompanying app. The phone or tablet slips into the controller to boost signal and everything else is easy enough even for first-time fliers. Some new additions that work across the range include Follow Me, to keep the drone locked onto your phone; Point of Interest, to keep locked onto one thing while flying around it; Waypoints, to fly a set path automatically while you focus on camera controls, and Intelligent Orientation Control, to help customise how you control the drone. This is the area where the variations between the drones really becomes a point of importance. Do you need the extras for that price jump? There are also other pricing options for the drones with extra batteries and a hard shell backpack to carry it all, but the jump is more than 100$.